Another installment in my irregular updates and it's good news on the Nanorhythm front again. 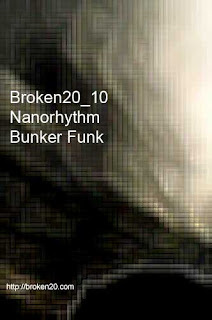 This time, my alter ego has taken to the decks and knocked out a mix / podcast for his new home, Broken20. Clocking in at around 70 minutes, Bunker Funk dishes up a helping of stripped down warehouse-friendly techno, featuring cuts from some of my favourite dancefloor-focused producers and a cheeky little number, hot from my own basement studio. Head on over to Broken 20 to check it out for yourself. Things are shaping up nicely on the release front too, with my debut EP, 'Beyond the Green Wall', scheduled to drop around June / July time, featuring two cuts of my own plus remixes from TVO and Spatial. You can check out Spatial's remix as the opener on his recent mix for Hyponik. Keep your eyes on the wider Broken20 schedule too as there's some killer releases on the way in the shape of superb dubby techno from Isodyne (Forward Strategy Group) and utterly immersive ambient drone from Erstlaub which is about to drop and available at a ludicrously cheap price from Boomkat.